The House of the Rising sun is a real classic that I love teaching to beginner guitarists, as it involves several techniques, but is relatively easy to learn even at an early stage. It has great melody that my students love, so it’s a win-win situation :-). This beginner guitar lesson on House of the Rising Sun is split into 2 parts. 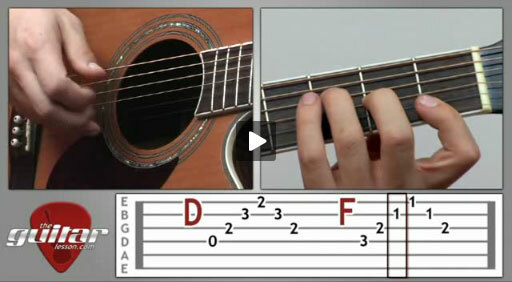 In the first part, you’ll be learning about finger picking and how to carry it out correctly. You’ll then start learning the guitar chords you’ll need to play the arpeggiated melody of the song, which is really helpful in advancing both your chord changing and finger picking technique. The second part of this song is centered around the lead guitar part of the song, and focuses on single string plucking, slides and the vibrato. All in all, if you are a beginner guitarist looking for easy guitar songs, this is a great place for you to start. You will learn a number of techniques that will really advance your skills, and you’ll have fun in the process, since you’ll be able to learn and play this song pretty quickly. The House of the Rising Sun is a U.S. folk song dating back to the 18th century. Like many classic folk ballads, it is uncertain where the song actually originated and who wrote it. The most famous modern version was recorded by The Animals in 1964, but Bob Dylan also had a famous recording of the track in 1962. The Animals version was a number one hit in many countries, and is the version most people associate the song with. Concerning the lyrics, the song talks about life in New Orleans, and depending on the version, it can be from a male or female point of view. Sorry, but you've reached a premium content area. The download of the House of the Rising Sun tablature file is only available to premium members. Sorry, the same goes for the backing track. To download the backing track to House of the Rising Sun, please log in and revisit this page.